The word Easter is only mentioned once in the entire bible, and then it was referring to PASSOVER. Yes! PASSOVER that is mentioned in scripture seventy six times…… it is written the word will offend some and some may not believe the holiday Easter has nothing to do with Christ. (Acts 12:1-4)., but no matter how many eggs are colored and decorated or the telling of fun bunny stories to your children it still remains a tradition of men which makes void the true word of God. PASSOVER was a judgment God executed against Egypt and all the firstborn males were to be smited, except death was to PASSOVER any house that had blood on each doorpost and above it. (Exodus 12:5-14). God took this PASSOVER very seriously just as HE expects us to take the PASSOVER LAMB HE sent the Lord Jesus Christ to us without blemish for the purpose HE was crucified and we are told this memorial was to be kept forever. (Exodus 12:14). And this day shall be unto you for a memorial; and ye shall keep it a feast to the Lord throughout your generations; ye shall keep it a feast by an ordinance for ever. So how can colored eggs and easter candy make up for what Jesus went through on the cross as HE was sacrificed for to purge us from all sin. Jesus kept the PASSOVER and before HE was to go to the cross HE desired to eat PASSOVER with HIS disciples, and it was at the last supper HE explained in detail the purpose of HIS life, not only for them but for all mankind! (Luke 22:1,9-20). Now the feast of unleavened bread drew nigh, which is called the Passover. And they said unto him, Where wilt thou that we prepare? And he said unto them, Behold, when ye are entered into the city, there shall a man meet you, bearing a pitcher of water; follow him into the house where he entereth in. And ye shall say unto the goodman of the house, The Master saith unto thee, Where is the guestchamber, where I shall eat the passover with my disciples? And he shall shew you a large upper room furnished: there make ready. And they went, and found as he had said unto them: and they made ready the passover. And when the hour was come, he sat down, and the twelve apostles with him. And he said unto them, With desire I have desired to eat this passover with you before I suffer: For I say unto you, I will not any more eat thereof, until it be fulfilled in the kingdom of God. And he took the cup, and gave thanks, and said, Take this, and divide it among yourselves: For I say unto you, I will not drink of the fruit of the vine, until the kingdom of God shall come. And he took bread, and gave thanks, and brake it, and gave unto them, saying, This is my body which is given for you: this do in remembrance of me. Likewise also the cup after supper, saying, This cup is the new testament in my blood, which is shed for you. Let’s put Christ back where HE deserves to be at this time of year! 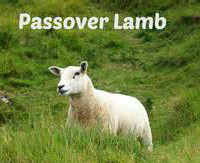 Our PASSOVER…… The Sacrificial Lamb God has sent for our salvation and leave out the traditions our forefathers that are vain, for although it may be fun with rabbit’s and candy it does not Honor what was done for us at the cross!